If you're like me,you're asking the obvious question right now....what kind of logical sense does verse 6 make after verse 5? Is this a misprint? 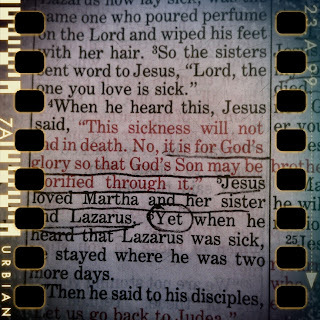 Jesus loved Martha, Mary & Lazarus, so when he heard that Lazarus was sick, he stayed where he was??? The same Jesus who turned water into wine,healed the official's son, healed the man at the pool, fed the 5,000, healed the blind man....stayed where He was when He heard that a friend He loved was sick? Where's the drop everything rush to the rescue? Where's the concern, the message sent back saying, "Hold on, I'm on my way..." Of all people who cared, He's the one who could do something, and everybody knew it....you know rescue was in the sisters' minds when they sent word to Jesus after all they had seen. Verse six leaves me shaking my head. If I was Mary or Martha, it would leave me wailing in a puddle on the ground...wondering if I misunderstood who He was. They didn't....but they did, and I don't....but I do. Jesus is God. He heals, creates, rescues and raises from the dead. I don't often misunderstand that. I do often misunderstand His purpose though. Go back to verse 4, read that one again. I don't know about you, but on first read I assumed that meant no death, no pain, Disney happy ending. But that's assuming God's purpose is happiness and comfort. I know that's not true, but my assumptions act like it is. God's purpose, in every circumstance, is His glory. 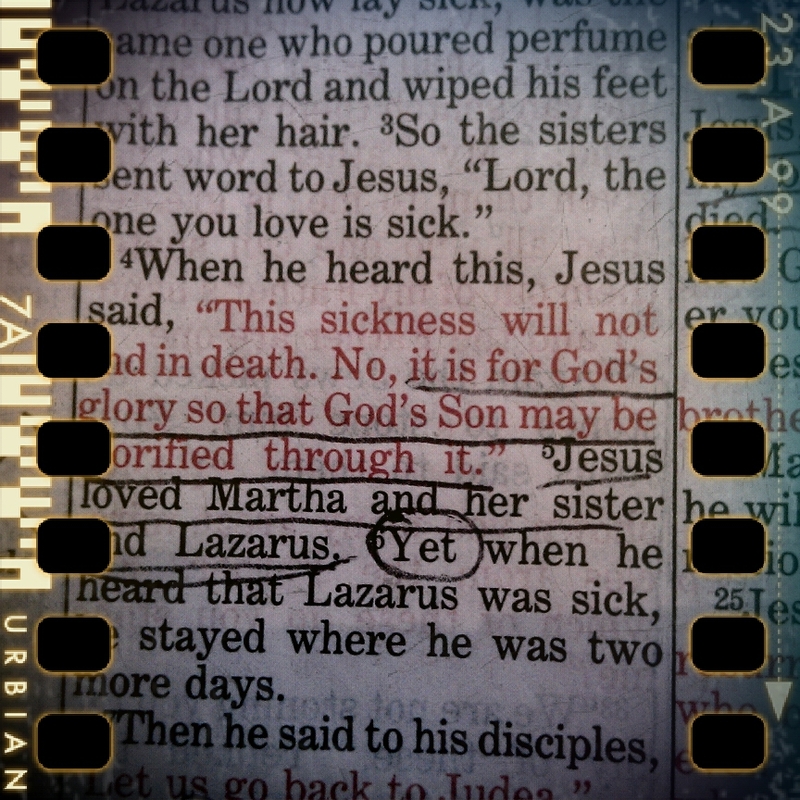 God's purpose that day for Mary, Martha, Lazarus and even Jesus required pain and weeping to be accomplished. God's plan included walking through pain, not running from it, avoiding it or denying it, but attaching a high and lofty purpose to it. 1. Let God's glory be seen through projects 2 through 10, especially if it hurts. Hey, Sister...your words this morning resonated in my heart. I can feel my own pulse pound with the memory of my anxiety at being in "snot-shoot" deep waters with an invisibly distant shoreline. Psalm 77 goes right along with this story from John...reminding that the path to rescue is oftentimes THROUGH what we are wishing to avoid...in fact the very thing we might think we're needing rescue from could be the means of deliverance. When I finally settled into where I was; when I finally decided to be present in my "suffering," to continually talk it through with God and just wait and see what He did...I began to be aware of Him in my life in a way I never had been before. I felt His arms bouying me through those waters like a Daddy with his baby in a swimming pool. Yes, it was far too deep for me to handle, but I was safe as could be. I look back on that time with a sense of fondness, now. Who could have guessed? Yes, He did deliver me...dramatically...from those deep waters, but in a way and at a time that was completely different from what I had been begging Him for, and His brand of rescue was so much grander, heroic, and absolute than anything I had been so sure was best! Thanks for this reminder, Lori...it is good to be reminded that He is working out His plan in the everyday struggle and pain, as well. I want to be present in this life He's given me, even though-or maybe especially because-there are things that don't work out the way I want them to. I want to be connected to His presence so that I am bouyed through my days and can operate each moment in the assurance of His arms propelling me toward that perfect redemption at the perfect time. I love you, Sister, and I'm really grateful for your tender and open heart to share what He's teaching you with all of us.